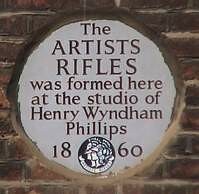 The Artists Rifles is a regiment of the British Army Reserve. Raised in London in 1859 as a volunteer light infantry unit, the regiment saw active service during the Second Boer War and World War I, earning a number of battle honours. It did not serve outside Britain during World War II, as it was used as an officer training unit at that time. The regiment was disbanded in 1945 but in 1947, it was re-established to resurrect the Special Air Service Regiment. Today, the full title of the Regiment is 21 Special Air Service Regiment (Artists) (Reserve) (21 SAS(R)) and with 23 Special Air Service Regiment (Reserve) (23 SAS(R)), it forms the Special Air Service (Reserve) (SAS(R)).